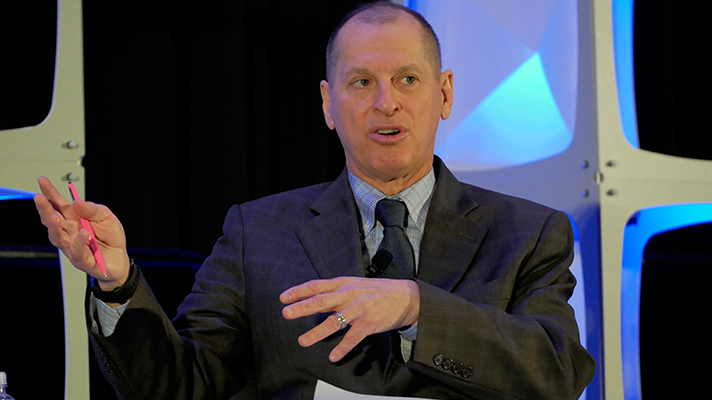 As president and CEO of the Computer Technology Association, Gary Shapiro has witnessed three decades of technological developments. CTA after all, runs CES, the largest consumer electronics conference, which also features the growing Digital Health Summit. Shapiro is also an author, most recently of Ninja Future: Secrets to Success in the New World of Innovation, for which he conducted a book signing at HIMSS19 in Orlando in February. I spoke with Shapiro after the global conference about how he sees digital health evolving – the challenges and opportunities, as well as the greatest threat to innovation in healthcare and elsewhere. Q. You have a perhaps unique perspective as head of CES on consumerism and digital health, relative to those of us who are watching startups and innovators – not to mention big tech titans – bring their apps, devices and other technology into healthcare. So from the view of someone on the other side of the consumer tech space, how do you see digital health evolving? A. It starts with the increasing costs of healthcare, the drug epidemic and people dying. Tech is a great equalizer, and the problems it solves in the U.S. may be different than in developing countries. When it comes to pain management, why should a drug be first, when there are technologies that can play a role in different ways? There's a whole bunch of technologies for managing pain. There are noninvasive ways of treatment such as focused ultrasound, an outpatient procedure that takes two hours to treat various forms of cancer that's shown great results, instead of chemotherapy. As we increasingly know more and more about personalized medicine and gene-specific therapies, you will obviously see new treatments for individuals. Research gets done and if it's significant it gets reported – but what doesn't get reported are the things that don't work. I am pretty confident that doctors for the most part do what they've been taught to do when they went to medical school, and it carries with them for life. Q. Which is a good point and we hear a lot about how it's become impossible for doctors to even keep up with the literature on what works, let alone figure out what doesn't. Is there an answer? A. I was especially excited at HIMSS19 when Aneesh Chopra said the EMR has failed and the private sector has to be responsible for medical records. The missing ingredient is that people will give up those records and correlate data based on individual factors. We'll have personalized treatments. But we also have a shortage of doctors. We will have a bigger shortage as docs retire and our population ages. We need the ability to use devices that consumers have to communicate with a doctor. We have sensing devices, which are still in early generations, but a lot of us are wearing them. The ideal is to allow people to not have to go to a doctor. At some point our healthcare policymakers will have to look at cost, frequency of treatment, disruption caused by treatments, whether there's a better way to do it – we're in a situation of immense national fiscal and personal health challenges. Q. The retail and finance sectors are held up as leading examples when it comes to analytics, user experience, harnessing all the data they have. But what are the lesser known industries that healthcare should look to or emulate? A. It depends who your customer is. But in today's world you should try different things, you need clear goals – to fail fast, try new things and see what works. The patient experience for the most part isn't great. Healthcare should measure yourself or let others measure you. To me, there's not enough experimentation in the healthcare world; it's very difficult to change existing processes. Q. That's a nice segue into my next question. In your newest book, Ninja Future, you write that "every company is a tech company." That's a notion some thought leaders in healthcare have put forth as well. Implementing a $100 million EHR, for instance, means that health systems should start thinking like software shops. How would you advise hospitals to learn to harness technology in their favor in new and novel ways? A. I passionately believe and have been saying it for several years that "automobile makers are tech companies, not car companies." We knew it stuck when those CEOs started saying it, too. In healthcare, consumers want the best they can get. That requires hospitals to provide it. There are basic strategies. It's not just getting into a technology system; it's getting out of it. They never ask about getting out of it, and then you end up with a legacy system that doesn't make any sense. So, make sure the investment you make will provide real value to your customers by asking what it enables patients to do. Someone has to understand the customer experience when we create new tools because otherwise it's frustrating for people. Another trend in healthcare they'd better pay attention to is the movement toward transparency: a focus on cost, asking whether there's a better way. The truth is that people are getting older, living longer, so healthcare needs are increasing and the supply of people who can take care of them is strained by immigration laws. The demographic trends point to a need for tech to analyze things, deploy remote monitoring and to get the necessary data out there. Q. You also stir the soup of cutting-edge technologies in your book. AI, analytics, big data, blockchain, cloud, virtual reality. When you look at the big picture of those, against the backdrop of your own experience having witnessed some 30 years of technological developments, where are they collectively headed? A. That's a big question. A. Smart entrepreneurs will figure out how to take advantage of them and improve lives, keep us healthy, enhance education. AI and 5G, together, can be used to help keep people out of emergency rooms by avoiding collisions. There are more than 35,000 deaths a year, cars, trucks and pedestrian deaths. We have the tech which will cut down on ER visits. The business of medicine, insurance, things will change in some ways. We're heading toward a safer, better world, and what keeps me going is allowing technology to prosper without the government messing it up. Q. What, right now, do you see standing in the way of that happening? A. One of the great threats to our world is the health of the economy, and the health of the economy is threatened by the level of debt we have. So we don't ask the government for much, maybe STEM, because we want to make sure we're clean when we talk about the debt. We focus on growing the economy through innovation, we talk about innovation in a very big sense, foster it through policy, carrots and sticks. Q. You also espouse the experience economy. One of the new frontiers in healthcare is improving the patient experience. You write about Berkshire Hathaway's wildly popular annual shareholder meeting and Prada standing up cafes in Italy or Lamborghini's experiential program – what can healthcare learn from those? A. When doctors go through the healthcare experience, it gives them a whole new level of empathy. Empathy is the new currency of success in healthcare. It's the whole experience the patient has from beginning to end. For example, restaurants give customers a device to tell them when their table is ready, even plumbers are focusing on the customer view. Delight them and you'll survive. Your marketing budget is less important than word of mouth in healthcare. It comes down to whether or not you are giving somebody something they deserve.